I've always felt the same about movies, and with this film Steve James wants to allow us to understand Roger Ebert a little better. James was able to spend the final weeks of Ebert's life by his side. Consequently we are allowed a window into his final hospital visits. Intercut into these moments at the hospital are conversations with the people who knew Ebert best. It's much like relaxing in the living room listening to old friends share stories and fond memories. We witness first-hand the gradual decline over these hospital visits. We know what's inevitably coming, and yet that makes his smile, and positive attitude all the more inspiring. Ebert mentioned that he wasn't afraid of death. Death is a part of life. His lifelong fascination with death, a part of his fascination with life. We are briefly taken through Ebert's life history with a few of the aforementioned memories told by friends interspersed. Many of his friends are filmmakers, such as Martin Scorcese, and Werner Herzog. It's fitting considering Ebert, controversially, mingled with and befriended the filmmakers who's movies he reviewed. Now these filmmakers appear in Ebert's film. The film doesn't spare us a few of the ugly details of Ebert's life either. It covers his alcoholic years, his bad choices in women (before his happy marriage to Chaz). It catalogs the toughest parts of his relationship with Gene Siskel. In fact, the portions of the film devoted to Siskel and Ebert's show, and working relationship are some of the most fascinating in the film. As their relationship turned to one of growing friendship and respect, we see Siskel's death and Ebert's love and admiration for his friend. It's one of the most touching moments in the film. We hear from lesser known filmmakers that Ebert touched as well. They explain that even though a man of his stature had no reason to take the time to see their little films, he did. And more than that, he understood their personal tales. He saw them for what they were, and the value held within them. Ebert always spoke of keeping in mind the historical and cultural context of a film in his criticism. Director Steve James, astutely shows us Ebert's final days in their context. He was fading away physically, and yet pioneering the world of online film criticism. He was ahead of his time in his online presence. James gives us the little known fact that Ebert had as many or more followers on Twitter as the likes of Kim Kardashian. That online presence became even more vital to Ebert's life after losing his ability to speak. 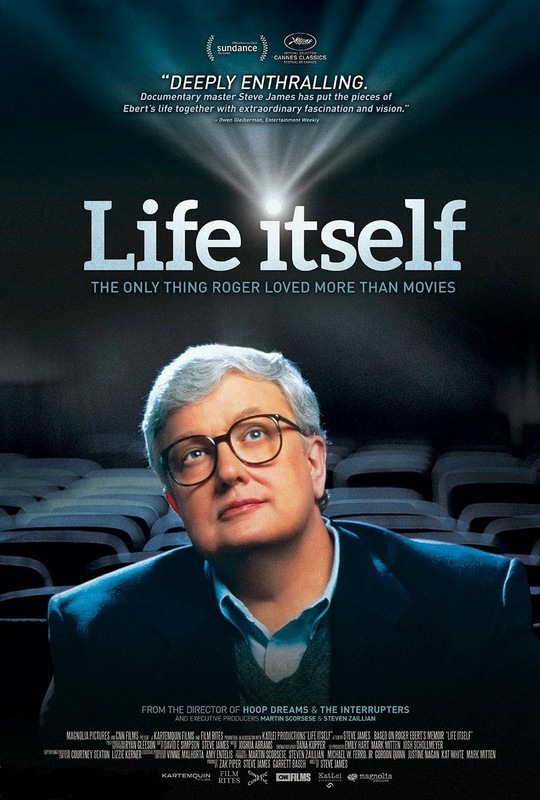 Life Itself is a touching, inspiring look at the life of one of the most profound, and inspiring writer's of our time. It successfully captures within the context of Ebert's life, what he himself found so valuable about film, and film criticism. Ebert was a brilliant man and a brilliant writer, who understood the value of film and could translate that value to the masses in a way that was both profound and easily grasped. Thankfully, he let Steve James make this film to capture his journey, giving us the chance to empathize with him.